We should all learn from Jacinda Ardern. 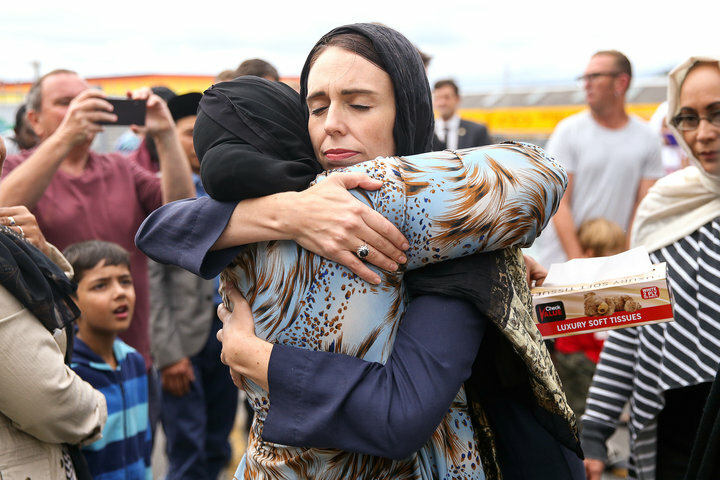 The strong and inspiring response by New Zealand’s Prime Minister Jacinda Ardern to the terrorist killing of 50 people in two mosques has taught us a critical lesson in leadership. When you face a moment of disruption, there are always two responses that are available to you: you can close down and turn backward or you can open up and lean forward. Ardern chose the latter by embracing the situation, empathically holding the victims, and taking bold action by announcing within a week that there would be a ban on semi-automatic military style rifles. Contrast that with the U.S. government’s response to the countless mass shootings in the U.S. Since 1970 alone more Americans have been killed by privately owned weapons than in all wars in American history (1.45 million vs 1.4 million). What is the American government’s response to the death count of 1,450,000 people? Nothing. Ardern makes us aware that our numbness to violent and senseless deaths, our lack of response, is not natural human behavior. It’s a choice, a choice that depends on the state of awareness that we operate from. That choice is relevant not only to politicians, but to every human being on earth because these types of disruptions –- shaped by the ongoing forces of technological, ecological, socio-economic, and political-cultural change ― will continue. The leverage point in all these situations is the same: to shift the inner place from which we operate. Instead of closing down and turning backward (in order to “make X great again”), we can choose to lean forward, embrace a difficult situation, and open our minds, our hearts, and our wills in ways that Ardern embodied so naturally. Right wing populism and Trump-style politics are not just American problems. Jair Bolsonaro in Brazil, Viktor Orbán in Hungary, Recep Erdoğan in Turkey, Vladimir Putin in Russia, Matteo Salvini in Italy, Rodrigo Duterte in the Philippines, and others operate similarly. Trump is the symptom. The deeper problem is the mindset of a closed mind, a closed heart, and a closed will. This is clear through different behaviors. The first is denial: shown in the U.S. through 1.45 million casualties and no action on gun laws but also through a refusal to act on climate change even in the face of rampant destruction by extreme weather conditions (floods, hurricanes, droughts, wildfire). There were 9,179 lies and misleading statements by President Trump in his first 787 days in office, according to The Washington Post, and no decline in his popularity among his supporters. We are desensitized. We get stuck in our own echo chamber where we lose capacity to empathize with people who hold different views. One study shows a 40 percent drop in the capacity to empathize among U.S. college students. Our social media feeds, filter bubbles, echo chambers, dark posts, and algorithms prioritize extreme views and false information over balanced views and facts. Instead of self-reflection, we blame others. Facebook used these tactics when it hired the consultants Definers Public Affairs to divert attention from criticism that the company was undermining democracy. It is likewise on full display when the NRA calls for arming teachers as a way to address the school mass shooting epidemic. We continue to cause destruction. Destruction of nature (pulling out of the Paris climate agreement, dismantling the EPA), of societal foundations both domestically (media, judiciary) and globally (multilateral institutions) and of our humanity. The upshot of all the above? An amplification of violence. And it’s not just direct violence but also structural violence, through social structures that fail to meet people’s basic needs. These problems are supercharged by a powerful industrial complex that mass produces ignorance, hate, and fear. At the core of this industrial complex are two main forces. Firstly, there are special interest groups including the Koch brothers, who have invested more than $100 million into building a climate-change denial industry, according to Greenpeace. Secondly, there are Big Tech companies that put profits and ambitions ahead of the well-being of their users and of society. The Silicon Valley–based big data companies are at the center of a mutation of capitalism that Harvard’s Shoshana Zuboff calls Surveillance Capitalism and that divides citizens into two groups: watchers and watched. “Surveillance capitalism,” Zuboff wrote in her book, “unilaterally claims human experience as free raw material for translation into behavioral data.” That data is extracted, modified and then sold by Big Tech companies without any real consent on the side of the watched. The first signs of a human response to this silent takeover have started to take shape globally. Among the U.S. Democratic presidential candidates, at least one has proposed breaking up the Big Tech companies based on their abuse of monopolistic power. Senator Elizabeth Warren (D-Mass.) explains using a sports analogy: “You can be an umpire or you can own teams,” she said. “But you can’t be an umpire and own one of the teams that’s in the game.” Elsewhere, the European Union is creating regulations that put citizens’ ownership rights to their own data at the center of the conversation. The main question remains how can we as individuals and societies strengthen our capacity to respond to disruption as profoundly as Ardern did last week. How can we shift our own inner conditions from a closed to an open mind, heart, and will -– both individually and collectively? For deep social change we need to build collective capacity. We need to see and recognize everyone’s future potential, actually listen to people with our minds and hearts wide open and support each other, cultivating trust and belief in one another. That’s our work. That’s what we have to massively scale up to support the profound personal and societal transformation that we know is necessary throughout this century. The above article was originally published at www.huffpost.com on March 27, 2019. For the remainder of this year my monthly blog posts will offer practical examples of how to reinvent our economies, democracies, and educational systems in ways that embody a shift of consciousness from ego to eco. I’ll write about principles and practices that allow you to become a co-shaper of this movement in your context of work. A monthly online dialogue series on the same topics will invite everyone to join the conversation. To take part in the Dialogue on Societal Transformation (and blog) series, click here. I want to express my gratitude to Kelvy Bird for creating the figures and for co-inspiring the above concept of container building. Otto Scharmer is a Senior Lecturer at MIT, a Thousand Talents Program Professor at Tsinghua University, Beijing, and co-founder of the Presencing Institute. He chairs the MIT IDEAS program for cross-sector innovation that helps leaders from business, government, civil society to innovate at the level of the whole system. He is author of Theory U (translated into 20 languages) and co-author of Leading from the Emerging Future, that outlines eight acupuncture points of transforming capitalism. In 2015 he co-founded the MITx u.lab, a massive open online course for leading profound change that has since activated a global eco-system of societal and personal renewal involving more than 100,000 users from 185 countries. With his colleagues he has delivered award winning leadership development programs for corporate clients and co-facilitated innovation labs on reinventing education, health, business, government, and well-being. Otto received the Jamieson Prize for Excellence in Teaching at MIT (2015) and the EU Leonardo Corporate Learning Award for the contributions of Theory U to the future of management (2016). In 2017 he was ranked #1 of the world's top 30 education professionals by globalgurus.org.